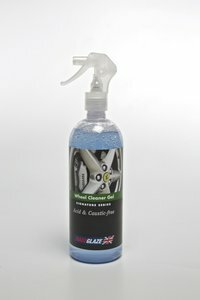 One of our favourite brands, Race Glaze have launched a new Gel acid and caustic free Wheel Cleaner, which has both distinctive properties and presentation. It exhibits the best features of products designed to effectively cleanse, those which are a thick, viscous gel formula so stay on the wheel and clean without running off, and products which are safe to use on all wheels. Suitable for alloy, steel, painted, chrome wire and anodised wheels. Its blue, effervescent colour is also striking. Being both acid and crucially caustic-free means Signature Wheel Cleaner avoids the main drawback with acid-free products, which is that they are often strongly caustic. The new Race Glaze product will effectively clean your wheels, stay in contact with brake and road debris and not run off, which improves economy and lessens environmental run off. Well priced, very effective and easy to use wheel cleaner. "Great on the phone, Goods came on time as requested. Made my car top look like new. Will order again. Many Thanks"